Our hearty congratulations go to Derek Sellen, winner of the second Five Words competition for his poem Survivor. Derek will be the guest poet at Ó Bhéal’s 8th anniversary event in April. Our best wishes go to all the shortlisted entrants, and for highly commended entries from Afric McGlinchey and Adannaya Igwe. Thanks to everyone who took part this year, and to judges Billy Ramsell and Jennifer Matthews for their excellent choices. These poems will appear in Five Words Vol VIII, to be launched at Ó Bhéal on Monday the 13th of April 2015, along with an award presentation and readings from available contributors. The 3rd Five Words International Competition will commence at noon on Tuesday the 14th of April, 2015. 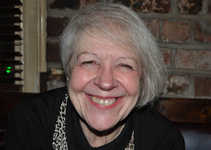 For those who missed our end of year reading with Liz Lochhead (the Scots Makar / National poet of Scotland), we have all 13 of Liz’s poems on video for you. Liz gave a fabulous reading and an excellent open-mic followed to end off the year. With thanks to Rab Urquhart for capturing the footage. (or on the Ó Bhéal Youtube channel). The 2nd Winter Warmer festival at Sample Studios was a resounding success, with a mighty array of exceptional poets drawing fantastic crowds throughout. It’ll be more than difficult to match next year, but that won’t stop us trying! We have one video from each guest poet’s reading/performance at the festival (in order of appearance), including the closed-mic. A class night of jazz-poetry with Patrick Cotter accompanied by Mo O’Connor, Pat Barrett and Niall Dennehy, and followed by an excellent open-mic for our 7th jazz-poetry night. The videos (filmed by Stephen O’Riordan) of both the main set and the open-mic are here. This year’s Cork-Coventry Twin Cities poetry exchange welcomed five new and talented voices. 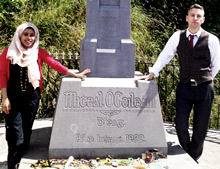 Representing Coventry were two exciting young poets: Adam Steiner and Saleha Begum, while Cork returned with three well-known local poets: Adam Wyeth; Kathy D’Arcy and Cal Doyle. Over three days in July the Coventry poets gave readings at Ó Bhéal, the West Cork Literary Festival and at the Whitehouse in Limerick. They visited Lord Mayor Cllr. Mary Shields at City Hall and travelled through counties Cork, Kerry and Limerick, making various detours to visit historical monuments and rare curiosities like The Time Traveller’s Bookshop in Skibbereen. In November the Cork poets gave readings at The Big Comfy Bookshop in Coventry and also in Burton-on-Trent, visited Lord Mayor of Coventry Hazel Noonan who accompanied them on a tour of the old Cathedral ruins. They were interviewed live by Kate Hills on Hillz FM Radio and also visited Stratford and Birmingham. For the full review from the participants, with photos, click here. 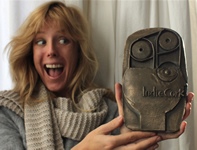 Our congratulations go to Marleen van der Werf whose beautiful film Wadland, a breathtaking portrayal of sea-life found in tidal areas, is this year’s poetry-film competition winner at the IndieCork Festival of Independant Cinema. Marleen’s film was under strong competition from the other thirty shortlisted entries, which you can see here. This year the films were screened in the main Firkin Crane theatre on Shandon where the huge screen and cultural location made it the perfect venue. Thanks also to the participating filmmakers and poets who travelled from afar for the screenings: Svitlana Reinish (Ukraine), Silvie Wolff (Netherlands) and Kevin Barrington (Dublin). We’re already looking forward to next year! Submissions will be open for the 3rd Ó Bhéal Poetry-Film Competition from May 2015. 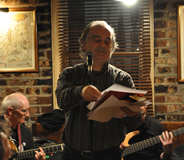 Our congratulations go to Don Nixon, winner of this inaugural five words competition for his poem, Fado in a Lisbon Bar. And congratulations to all the shortlisted entrants, and for highly commended contributions from Afric McGlinchey and Janet Lees. These poems will appear in Five Words vol VII, to be launched at Ó Bhéal on Monday the 14th of April 2014, along with an award presentation and readings from available contributors. Thanks to the City Councils of Cork and Coventry, the 2013 Cork-Coventry Poetry Twinning exchange saw five poets travel from their respective twin cities to share their work. Representing Coventry were Tom Wyre, Sarah James and Martin Brown, and for Cork, Julie Field and Rab Urquhart. 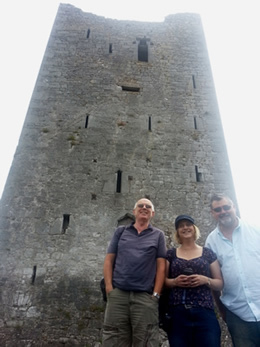 The Coventry poets visited for three days in July and gave readings at Ó Bhéal and at the Whitehouse in Limerick. They visited Lord Mayor Cllr. Catherine Clancy at City Hall and made daily excursions to Spike Island, the Old Head of Kinsale, Blarney Castle, Lough Gur and Cobh, while during a reciprocal three-day visit the Cork contingency gave readings at Playwrights Café in Coventry, the King’s Head in Litchfield and at the Old Crown in Birmingham, visited Lord Mayor Cllr. Gary Crookes and were interviewed live on Hillz FM Radio. 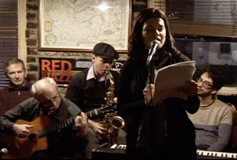 Oh what live jazz and poetry can create – our 6th jazz-poetry night in October saw Dimitra Xidous team up with musicians Gary Baus, Jack O’Rourke, Mo O’Connor and Michael O’Callaghan. So we won’t harp on about the magic when the videos (filmed by Stephen O’Riordan) of both the main set and the open-mic, are right here. Ó Bhéal is pleased to announce its association with the inaugural IndieCork festival of independent cinema (www.indiecork.com). 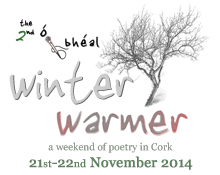 This is Ó Bhéal’s fourth year of screening poetry-films (or video-poems), and the first year featuring a competition. 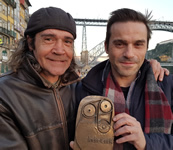 Winner announced 2Oth Oct 2013: Congratulations goes to Manuel Vilarinho from Portugal, whose poetry-film No País Dos Sacanas (In the Land of Bastards) has won the IndieCork Festival prize for best poetry-film, in the Ó Bhéal International Poetry Film Competition. Synopsis – To be a crook and a half in the country of crooks? No, since everyone is, at least two. 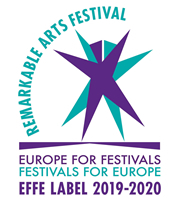 The full programme for the competition shortlist is here.